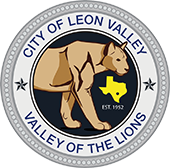 The City of Leon Valley is experiencing an increase in the number of Oak trees contracting Oak Wilt and dying. The area between Evers and Bandera roads in the Castle Estates neighborhood has been hit especially hard, as has the Monte Robles Park area behind John Marshall High School. The disease has now “jumped” across Evers Road and is threatening the Forest Oaks neighborhood. The City will be trenching along Forest View and Forest Grove in an attempt to stop the spread of the disease underground in the area, but residents are urged to investigate injection of their Oak trees now, as trenching has not proven to be the most effective way to treat the problem. Injection of the trees involves uncovering a portion of the root system and injecting the lowest portion of the roots with the fungicide propiconazole. The fungicide will last approximately 18 months and will then have to be repeated to assure proper protection. There are several companies that will perform this service. Residents may visit the Texas Oak Wilt website at https://texasoakwilt.org/ to find more information about Oak Wilt and programs and assistance with this lethal tree fungus. The City’s Oak Wilt Prevention Policy and ordinance states that anyone causing a wound to an oak tree, whether from ground maintenance equipment, trimming, cutting or pruning at any time of the year, shall paint the wounded tree with permanent sealant or nonphytotoxic tree wound dressing within thirty (30) minutes to prevent contact with contaminated nitidulid beetles. Any wound to an oak tree caused by weather conditions, such as a windstorm, is also to be painted with permanent sealant or nonphytotoxic tree wound dressing as soon as possible after a weather incident. The code further states that any person who discovers or suspects the presence of oak wilt should report the infected oak tree to the community development department, who will then cause the tree to be examined by a member of the state forest service for the proper diagnosis and subsequent care. Whenever possible, persons should avoid trimming or pruning live oaks and red oaks (Spanish, Shumard, Texas Red, and Blackjack oaks) from March 1 to June 1. An annual permit with proof of liability insurance and two (2) hours of professional training is required for commercial contractors providing tree cutting or pruning services. Contact the Community Development Department at (210) 684-1391 x 226 for additional permit requirements, tree removal guidelines, and any applicable exemptions. The removal or disposal of Red Oaks with oak wilt disease must be taken more seriously because they can form highly contagious fungal mats. Their quick and proper disposal is important and necessary to prevent other oaks from being exposed or infected. If a Red Oak tree is diagnosed with oak wilt, the diseased tree is to be promptly removed and disposed of as recommended by the state forest service. Other oaks do not require special disposal (i.e., live oaks and white oaks). The City’s Tree Advisory Board (TAB) is directed to implement, as resources permit, measures aimed at education and prevention of oak wilt. The Board uses the “Eight Step Program to Oak Wilt Management” by the state forest service to promote oak wilt prevention. Report any violations of the policy and ordinance or sightings of further Oak Wilt spread to the Code Enforcement Officer at (210) 684-1391 x 229.